Sometimes the best way to see a city is with friends by your side. When those friends live in foreign countries, even better! 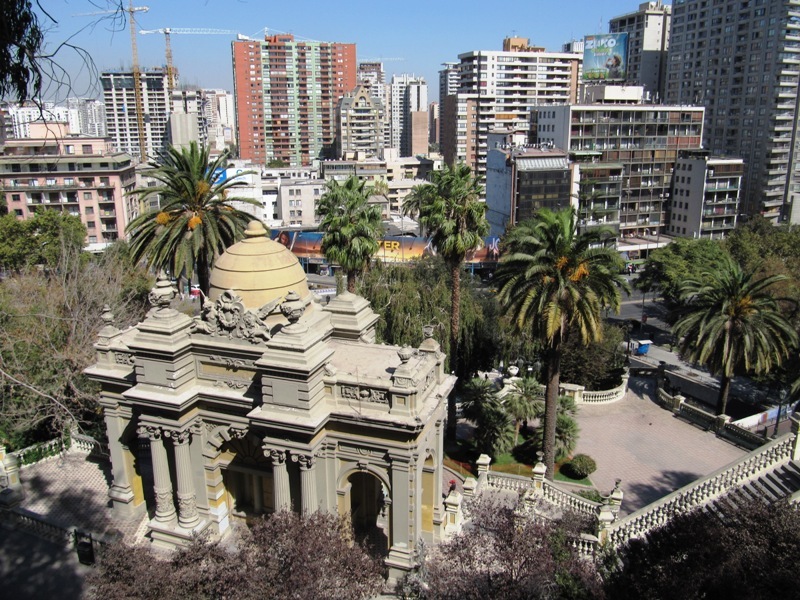 Santiago is a flourishing city wrapped with steep mountains and bustling with 50% of Chile’s population. Many of the best sights and food are only known to locals, so we were excited to temporarily move in with our friends Bobby and Stephanie. The last time we were together we had a great time exploring the wineries of Napa Valley. For our first day in Santiago, we decided to repeat the experience with a day trip to visit the Casablanca wine region as well as the coast. There are few better Saturdays than sipping on wine and going to the beach, so we had a perfect day planned. On a beautiful morning we rented a car and ascended from Santiago to find a valley lush with grape vines. Our first stop was Emiliana Organic Vineyards. The excellent tasting took place in a beautiful glass, wood and stone building. We bought two deliciously inexpensive bottles and we were on to the second winery. Cerro San Isidro is a modern, bleach white villa perched on the hillside. Overlooking the valley we enjoyed a delicious lunch. Back in the car and we were on our way through the mountains and then dropping in the colorful beachside communites of Viña del Mar and Valparaíso. 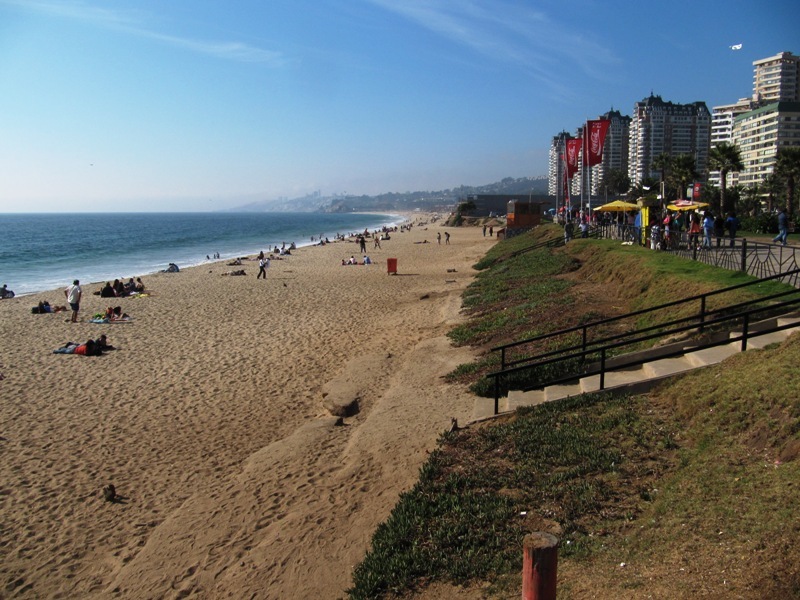 We enjoyed a walk along the beach boardwalk of Viña. 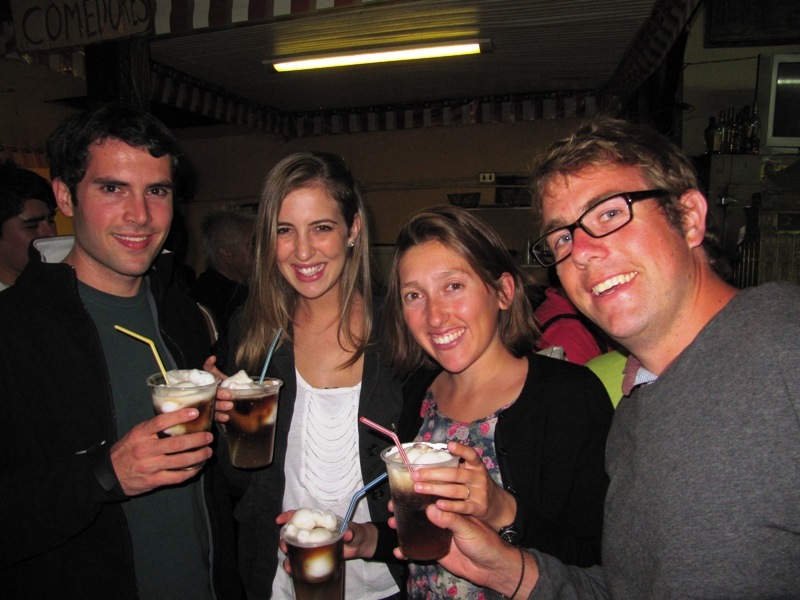 We sipped pineapple juice, ate churros and admired the local crafts. 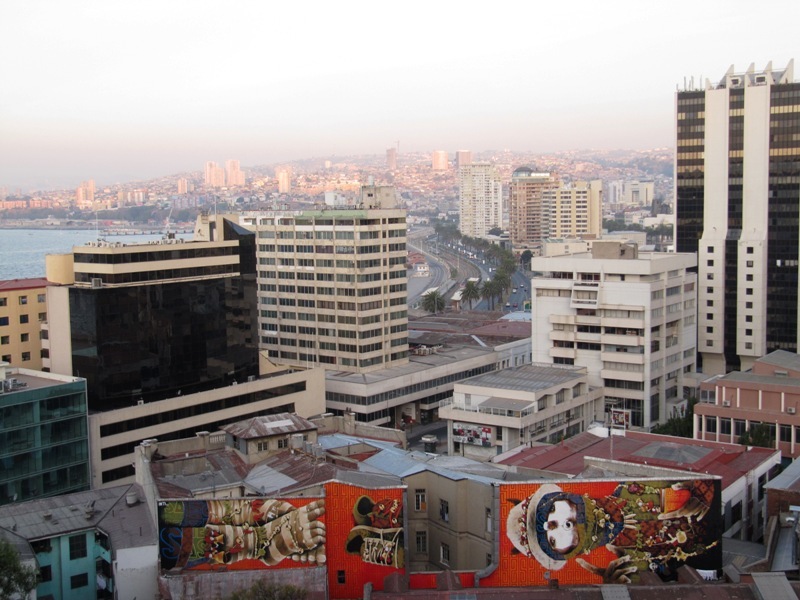 A short subway ride away (yes, they have a subway) and we were in Valparaíso. This small town has a colorful charm, steep hillsides with boxy buildings clinging to the slope. 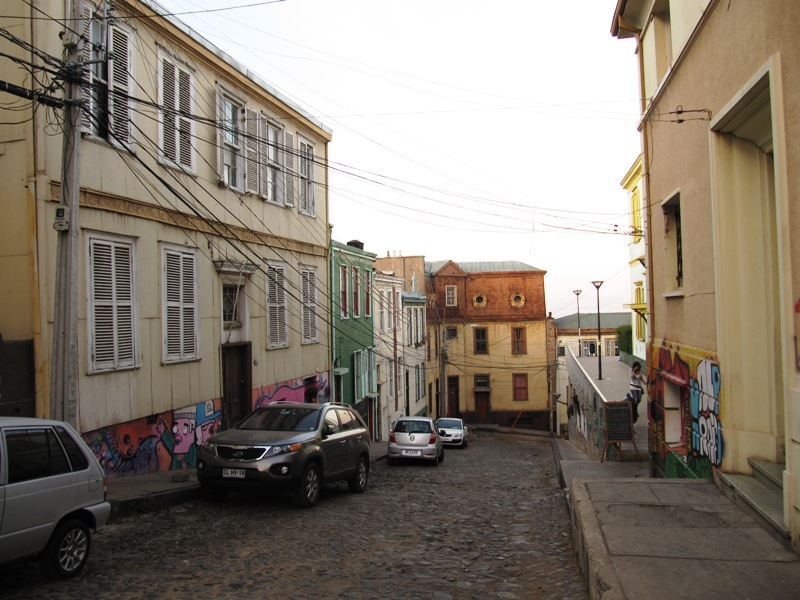 The streets are cobblestone and every visible wall and surface is artfully painted with murals. The art was political, scenic, cultural and sometimes just tagging. But the graphic images gave the city an intriguing sense of place that was fun to explore. A late night drive brought us back to Santiago. We were able to experience an excellent day trip only possible with local friends. 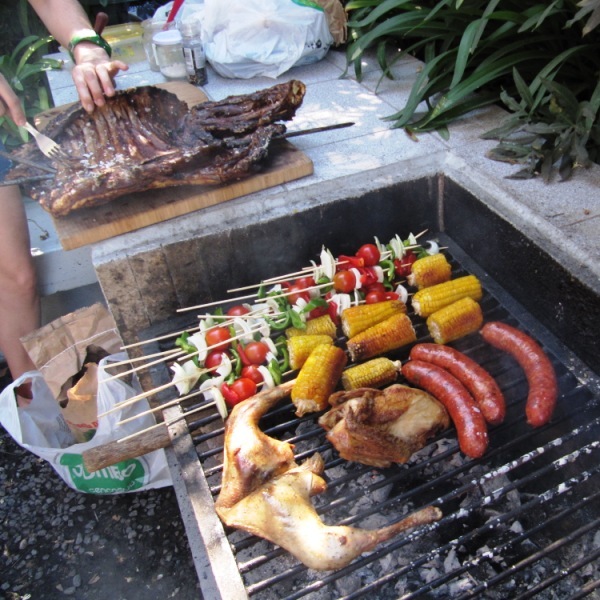 The next day we tagged along to a backyard asado (BBQ) and birthday party that rocked our world with a wonderful home-cooked meal. First there was pisco sour made awesomely pink and delicious with imported Arizona tuna (cactus apple). The main course was a fall off the bone lamb cooked in an stone oven then finished over coals and a brine bath. Sebastian and Laura were excellent hosts. Great food and a chance to speak Spanish with some interesting Chileans made for a special afternoon. There are more than enough activities to keep busy for a few days here. 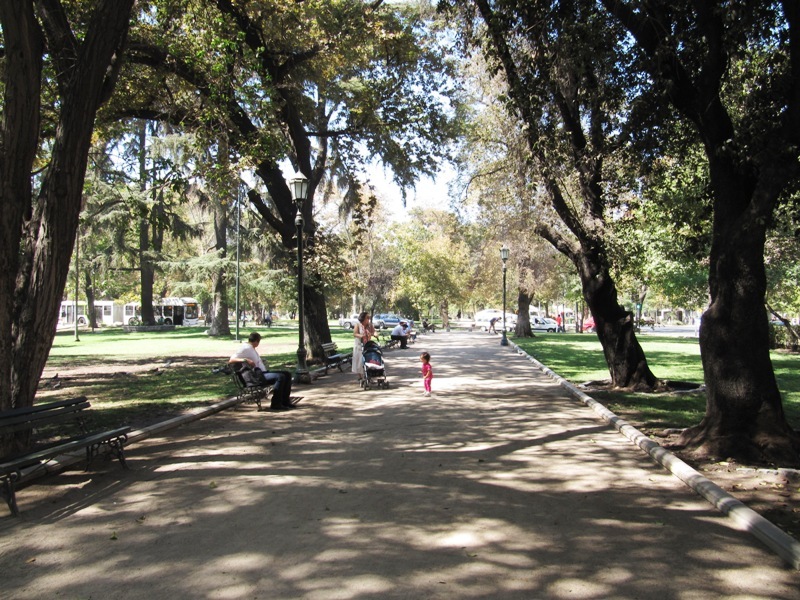 We were staying in the Las Condes area that had a beautiful rose-lined park. 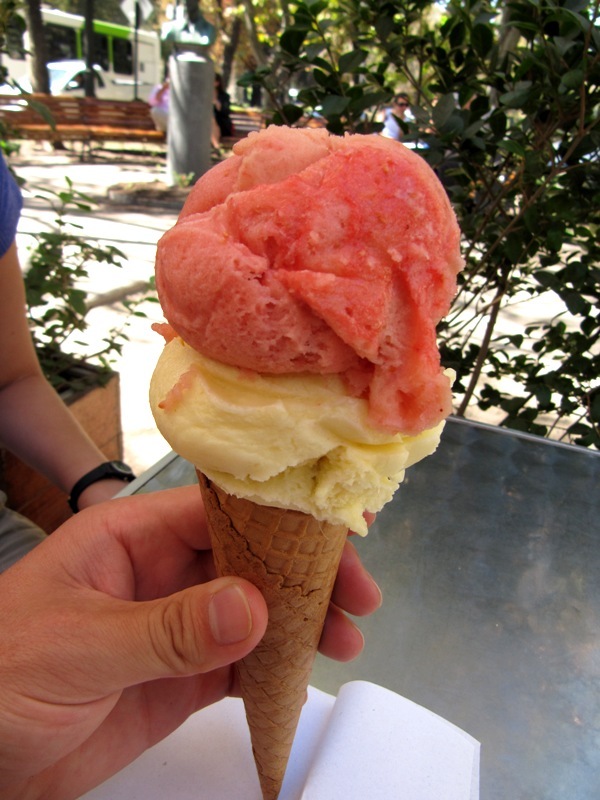 Close to the center the slender Parque Forestal offered Parisian-like strolls and locally crafted ice cream. We enjoyed frutas del bosque (forest fruits) and thai ginger. There are a few vistas in the city, but be warned that the air quality is pretty bad. 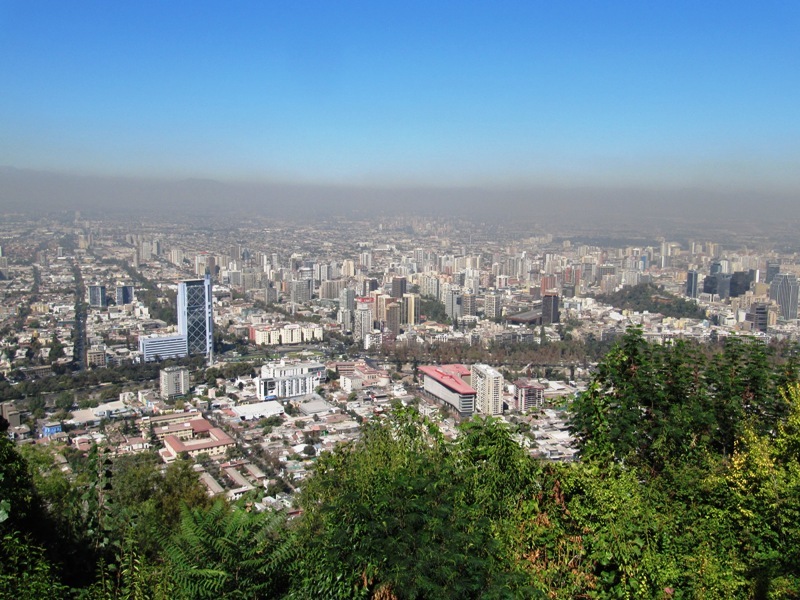 Santiago is surrounded by mountains that offer crisp snowcapped views in the winter, but in the summer the smog and dust becomes trapped, entombed by the mountains waiting for a storm to clear it out. Unfortunately our timing in Santiago was one of those bad air times. With our throats raspy and our skin scaly we climbed the Cerro de Cristóbal. We were surprised to find that we could only see a third of the city. In the center of the city we walked to Cerro Santa Lucía and we found an urban look at Santiago under the smog. There were many great places that we found only because of our friends Bobby and Stephanie. Kai is this vibrantly colorful and ornate Thai restaurant There was no sign, no entrance, but we walked through an unmarked doorway and found some deliciously spicy food. It’s funny how I miss certain flavors, and finally after weeks of travel Bobby and Stephanie showed me a place to excite my spicy taste buds. 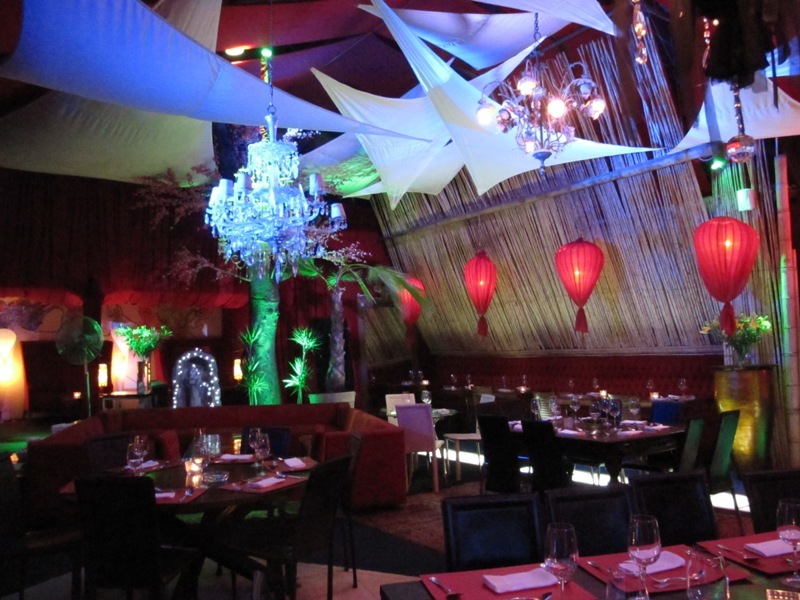 From one hidden door restaurant to the Chilean drinking hall of La Piojera we were welcomed into a new community of expat and Chilean friends. It was an initiation into the Chilean culture with cheek kisses and a round of terremotos (earthquakes). La Piojera definitely makes the ground feel like it’s moving as they scoop an iceberg of pineapple sorbet into a goblet of white wine and top it with a downpour of syrupy mead-like liqueur. The end result: an off-the-richter drink! The name terremoto is very apt and almost taunting because, like California, Chile has its share of ground shaking. To our benefit they have a good grasp on their earthquake engineering. One shaker caught us on the 25th floor of Bobby and Stephanie’s apartment. We stood there frozen and watching the building sway against the horizon. But the earthquake didn’t stop us from enjoying a few more drinks. Bar Clinic delivered an excitingly political atmosphere and a few local draft beers for us to enjoy the afternoon sun in downtown. 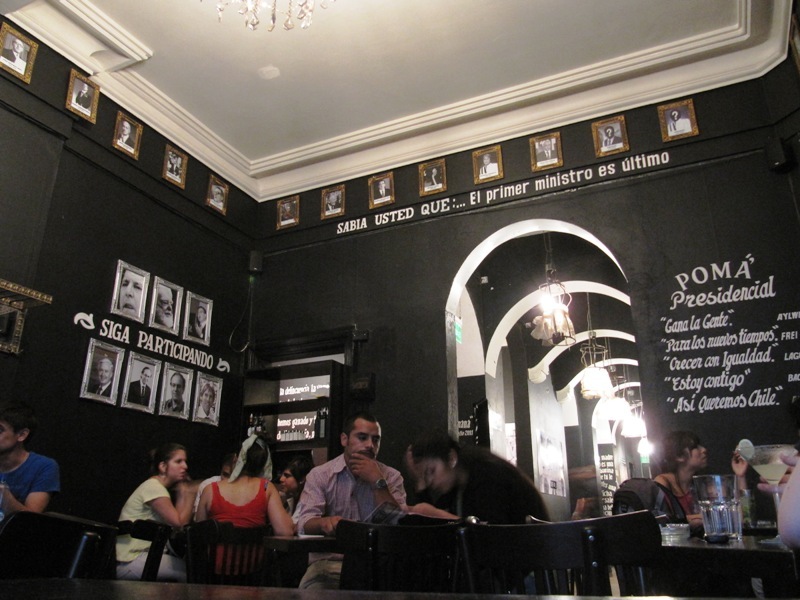 The walls were decorated with odd parodies and humor reminiscent of “The Onion.” Close by there were a few nice museums and plazas that dotted the city. Unfortunately the pre-Columbian museum that we were excited about was closed for renovations. We settled on the eye opening Botero exhibit on Abu Ghraib which coincidently enough was on loan from the Berkeley Art Museum. Santiago has a culinary dish that we frequently spied on other tables. 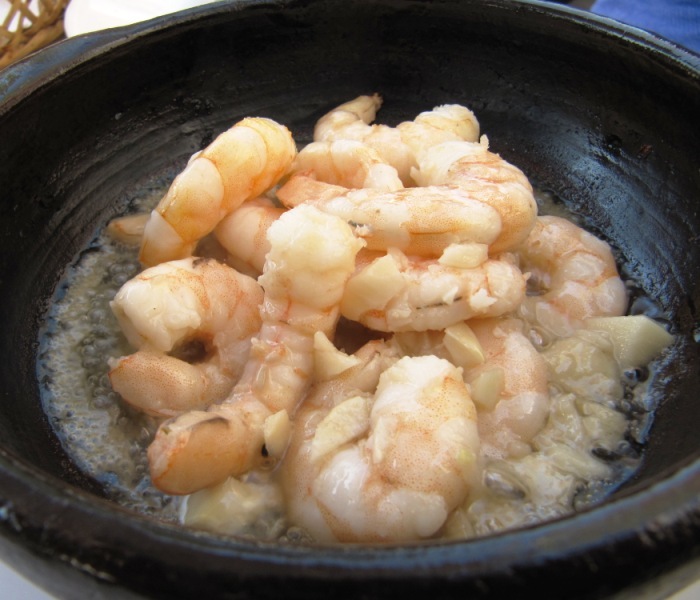 They grill up tiny shrimp in butter, garlic and optional chili peppers in a small cast-iron pan. It is delivered sizzling on the table. Each shrimp turns bright red, perfectly cooked and succulent. We liked it so much that we ate it twice, once at the excellent restaurant Galindo and then again at the seafood market. 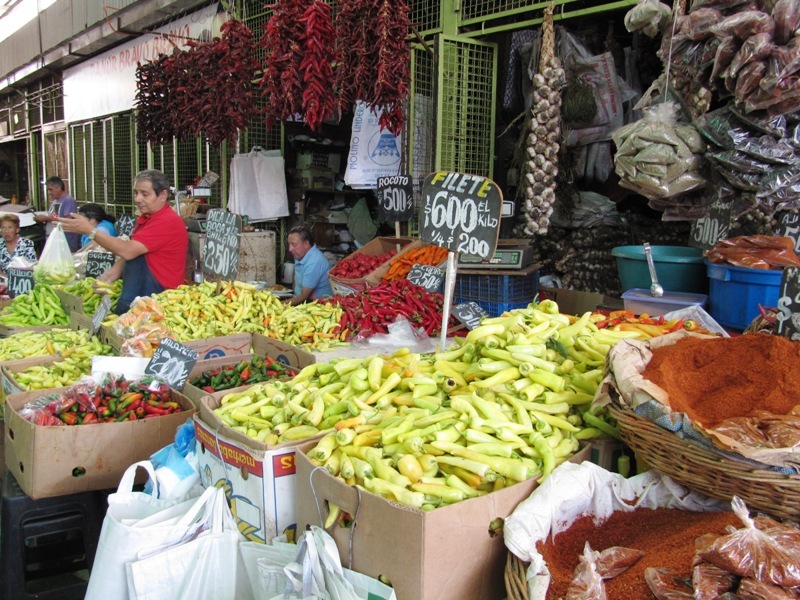 The fresh food market in downtown Santiago is enormous. Carmen and I spent hours roaming the aisles of meats and produce and we did not nearly see all of it. 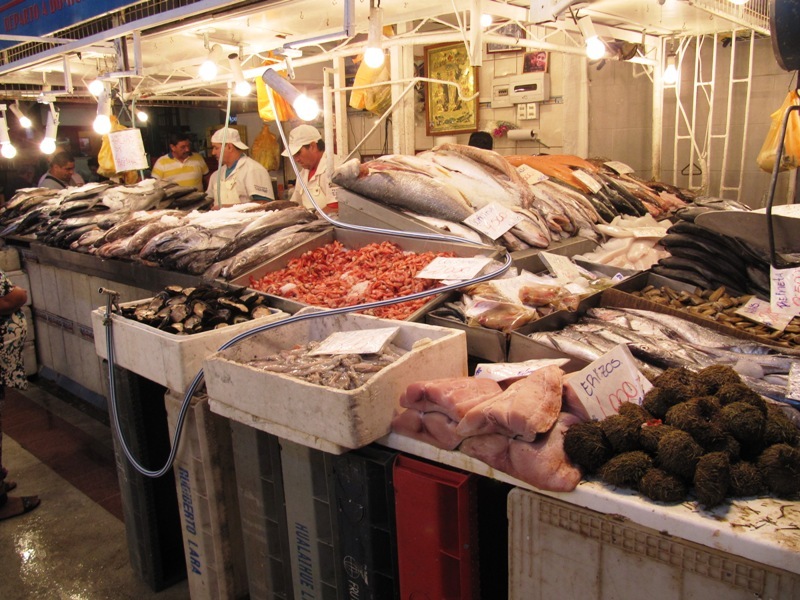 The first of the markets is the fresh seafood. Fifty or so vendors and another fifty or so restaurants called out to us as we walked by. They held up huge pieces of salmon and others showed off their practically alive mackerel. We settled for the tiny, perfect little shrimp. Across the street is where the craziness of fresh food begins. The first building is relatively empty and almost fooled us, except that this is where we found all the locals eating their farm to table fill of local meats and vegetables. Further on there are a series of buildings and warehouses each with dense stalls of vendors. This area is called La Vega (the field). We found a vendor selling thirty types of peppers, another tomatoes, and another showed a seemingly life-cycle display of the onion. He had mounds of chives, perfect green onions and even bright purple and plump onions, to complete the family huge leeks overflowed their crate. 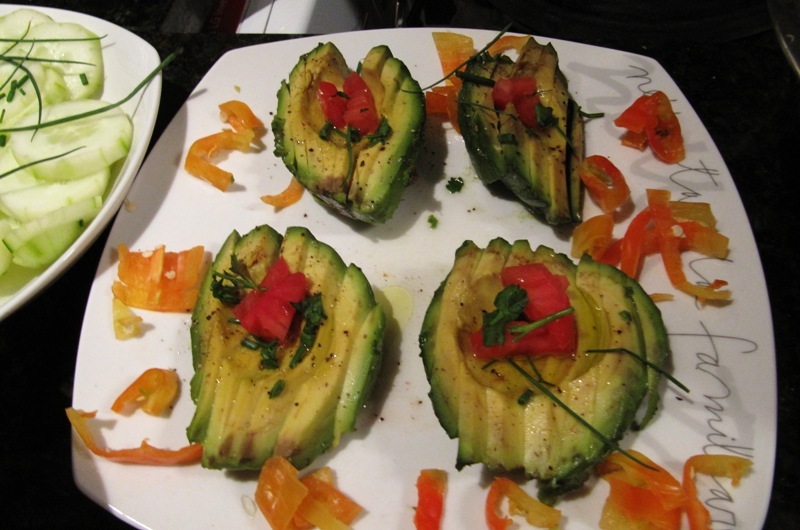 We were most excited for the paltas (avocados) which were tender and ready to eat for only $1/lb. There were dried fruit vendors, grains in bulk and, of course, meat. Huge sections were devoted to poultry or beef and occasionally we’d see a rack of lamb. All cuts were displayed their glass cases and ready to take home to cook. 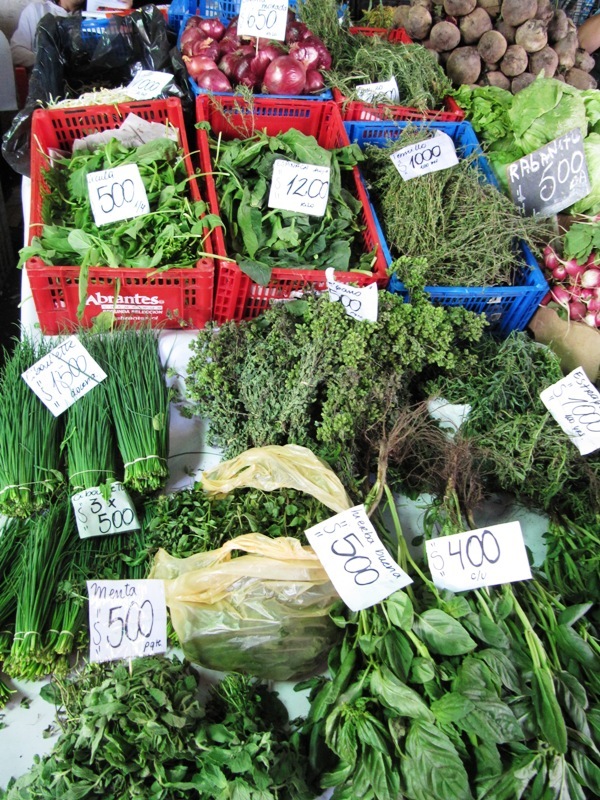 We wandered through the fresh food market gaining inspiration for a delicious meal. 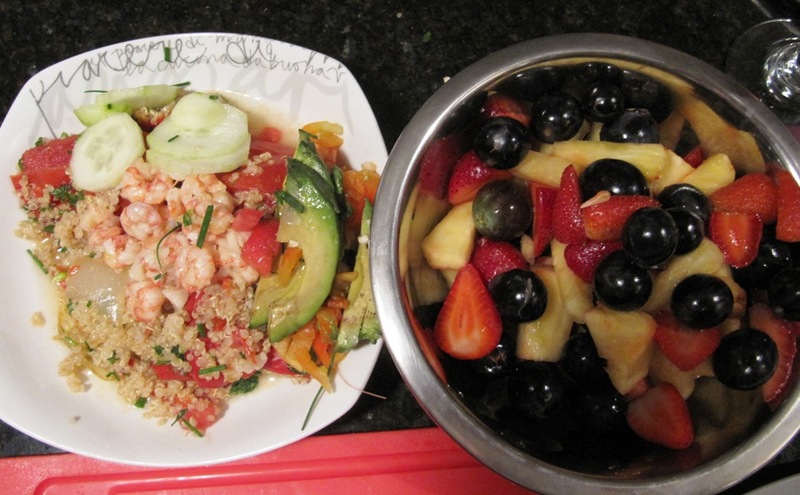 We picked the spiciest peppers, colorful quinoa, and a mix of plump veggies. Back at the apartment, we cooked a feast and shared some wine. 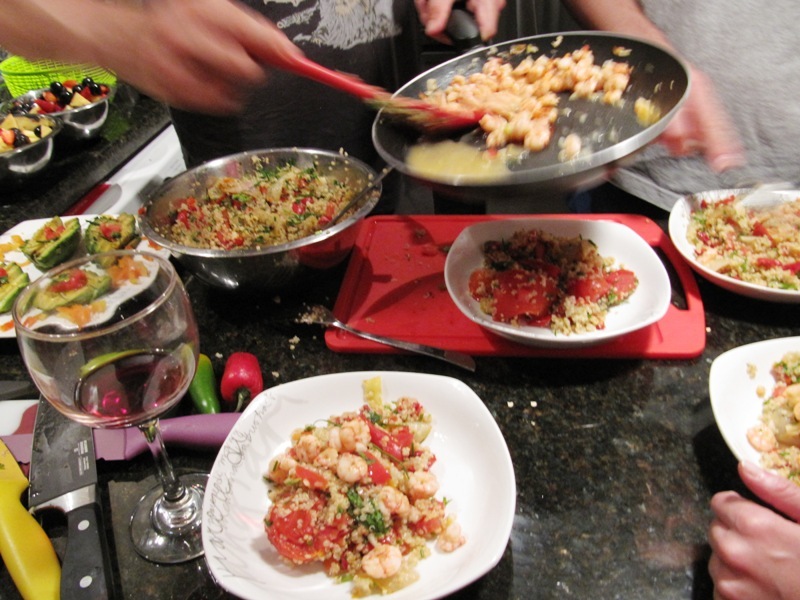 A home cooked meal that was perfectly fitting end to our days in Santiago. Thank you to our wonderful hosts, Bobby and Stephanie! From now on, I will only read your blog around lunch time. This makes me hungry! Beautiful photos, and great narrative. Keep it up! 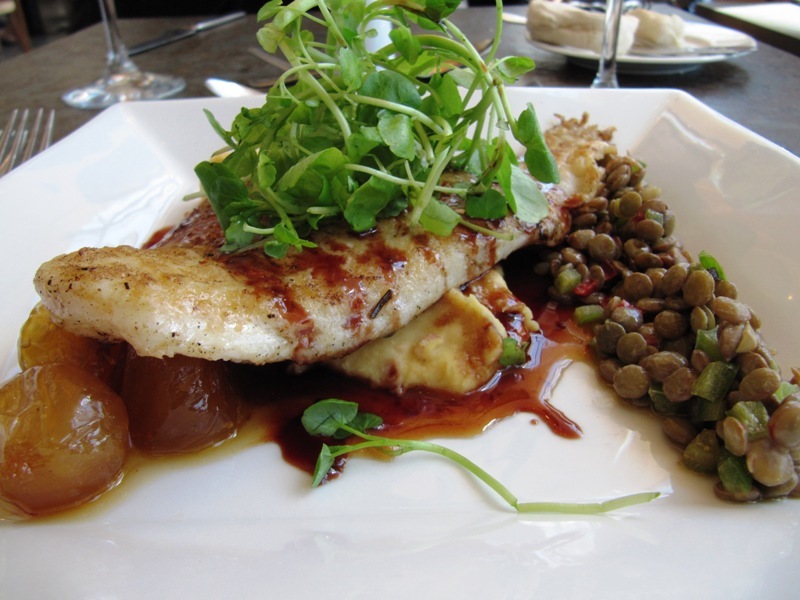 There is so much to write about…and food to eat. We’re glad you like it! 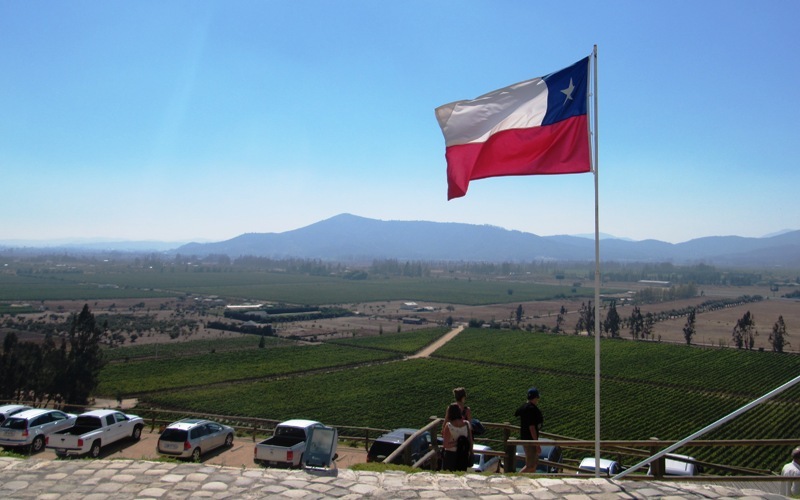 I want to go back to chile now!!! !